We did not print the previous list that was compiled because there were many people whose names were submitted without their knowledge or consent. At the same time, the idea of having names on the back of the poster is valid and it is popular. It validates those who made their actions known and carry it in perpetuity. It is another form of expression that Defends the Sacred. Our original intent was to have a symbolic list to honor those who were at the camp. Understandably, a list with names of people where many did not choose to be named is no honor to them…no matter how well-intended it may be. I am thankful to the many who spoke up. 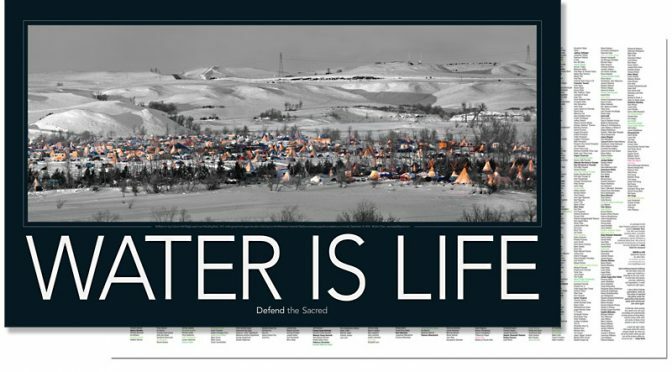 This new list is open to anyone wishing to stand and be listed on the back of the WATER IS LIFE poster. It will express our inalienable right to free speech, the protection of Clean Water, to treaty rights and to resolve conflicts with love nd compassion. We will gather 2500 names and print it in the next edition at the end of April. Deadline to submit your name is May 10, 2017. Those who actually stood at Standing Rock retain first rights to be listed. Those who were arrested or injured will be illustrated in BOLD. If you were, please make sure you are highlighted. We honor you. If you’ve submitted a list, please contact each person and alert them to this site or, if they are not on the internet, you can submit for them by stating their awareness and consent. Once we’ve processed all the past requests, we will publish this list for refinement and addition. You can opt in or out at any time. Thank you for your support. Previous PostFIRST POSTERS PRINTEDNext PostSTAND UP FOR THE SACRED! In honor of the protesters, I would simply like to call out BNSF’s role as DAPL’s chief competitor. BNSF, the company who operates the train that carries oil from the Bakken oil fields to the Gulf, stood to gain millions should the pipeline be blocked. BNSF also had several major oil spills (10) in the year leading up to the decision to put DAPL in the ground. Either via train or pipeline, oil is being redistributed and exported for the first time in US history. This is likely due to OPEC seeking to flood the market with oil, driving down prices and US oil profits. So, the true fight, is to reverse this piece of legislation, no? I mean, both trains and pipelines result in mass ecological damage. The pipeline was actually brought in as a potentially safer way to transport oil, and, unlike the train, it only brings oil, instead of additional gas, coal and potentially radioactive material. I believe BNSF was behind a lot of the major direct actions against DAPL in terms of funding and organization. This is actually illegal. Another thing to note: Who sponsors PBS newshour? BNSF Railways (owned by Warren Buffet). Someone nominated you and listed you as a supporter. Would be honored to be on the list, thank you John. Can I be on the list? I was a Keyboard Warrior, then and now. Honored to have you Sister! Please add my name: Haithem El-Zabri. I was at Oceti Sakowin in Oct & Nov. Thank you for this. Mni wiconi! I was at Standing Rock the entire month of September and October. I founded Two Spirit Camp which evolved into Two Spirit Nation and I was heavily involved in the kitchens, medic tents, schools, media team, direct action tent, Bismarck protest actions and also participated in some frontline actions. Thank you! Also FYI for anyone. I helped start a movement in Los Angeles called DivestLA that is aiming to make LA the next and largest city to Divest from a DAPL-funding bank (Wells Fargo) Please look us up and support us! We could be looking at 8 BILLION dollars! If you list your name we will honor you on the poster. is it possible to send you names by private message? or email? Yes, If you just go to “Contact Us” the message is not published. I would be honored to be on the list. I was out from Dec 3, up until the camps were cleared. Arrived August 2016 and left February 2017 to start the Longest Walk 5.2 was shot 10/27/2016, 11/20/2016. John Chao I would be honored to have my name added. Thank you so much. We have you as Dee Dee Hoggard Cates. Honored to be included. I was at Oceti Sakowin 2 weeks in October then again November through January. I will spread the word to those who may wish to have their names included. Hey John Please keep me/add me on this new list! <3 Thank You!!! I was a Water Protector at Oceti Sakowin in October 2016. And, stayed at the Pauite Camp. I heard the call and gave my support, unconditionally. And, continue to do so, as a Keyboard Warrior. I would be Honored to have my name submitted. I spent two months at Oceti and two weeks demonstrating at Washington DC. I’d be honored to have my name posted. Can’t just put names unless they give consent. I know. I got their consent. That’s why I’m sharing them, I thought I’d save them the trouble of making an account in order to let you know. If you can’t take my word for it let me know but I guarantee their consent has been given. As well, Andy Hoagland has given his (arrestee). Hello, I’d be humbled to be added to this list. I lived at camp (Oceti Sakowin) from mid December until the day of the raid (Feb 23rd I think) and arrests of the final residence. I left camp right before the raids began. I was at Oceti Sakowin twice and would be honored to have my name on the list. Hello John! We have talked briefly but as someone that was hit by a rubber bullet, I’d be honored to have my name on your poster. Thanks again for this beautiful contribution! I’m proud to have lived at all 3 camps. I was arrested with Grandma Regina on Feb. 23rd during the Oceti Raids. My facebook and info from my arrest is public. I want my name listed. Aubree Peckham. Thank you. Anyone in touch with Grandma Regina to get her permission? I am proud to have served my people by raising funds for the camps at Standing Rock 9-1 thru 11-14 I then took the Veterans Caravan journey from Portland Oregon and stood next to my people in unity until my return on 12-18-2016. I am of the Horse Nation and so I cared for the horses. It was an honor to go there and stand up for my family and I continue to work with the NW Water Protectors Counsel here in Portland. We were there a week in November. We did a fundraiser and brought many provisions, althoguh we did sleep in the casino. If approrpiate and if there is room, we would be honored to be on the list. Please list me. I was at Standing Rock around Thanksgiving and it changed my life. It would be an honor to be on your list. I see many people are offering proof they were there. My crew and I brought an entire, fully stocked camp kitchen which we set up and left in yurt village at Sacred Stone for Cheryl Angel’s camp. Let me know if you need more. And thank you for doing this. You are now listed. If there are others from your crew, they or you will have to indicate that they are willing and aware to be listed. We the Lloyd family of New Castle De stand with you! Thank you! Just Nicki Lloyd to be listed, or is there others? Are you including the over 500 Faith community leaders who came for 3 days in November? Anyone who comes here and submits their name will be listed. We will cut off at 2500 and start a new list afterwards. Thank You Kelly! You and your family are added. BTW, If you just signed up, your first message waits to be approved. Once it appears, your name has been added. I was at Standing Rock in the Sacred Stone camp back in November. I’d be honored to be listed. Don’t know if anyone else is able to, but I tried a number of times today to open the link and couldn’t. Anyone else out there have this problem? Also, can you please respond and let me know if my name has been added to the list of names for the back of the poster. I am one of the Veterans than went up when there was the call for the Veterans stand and march. Your name has been added. Not sure about what link you are referring to. Normally when you’re first time poster, the message stays in the pending folder until it is approved. Just sent us a message in Contact Us if problems persist. Thank You Richard! It could be that we have a very stringent firewall for spam subscriptions. One of the factors is numbers after the name. The trick to bypass is to attach a photo during sign-up. 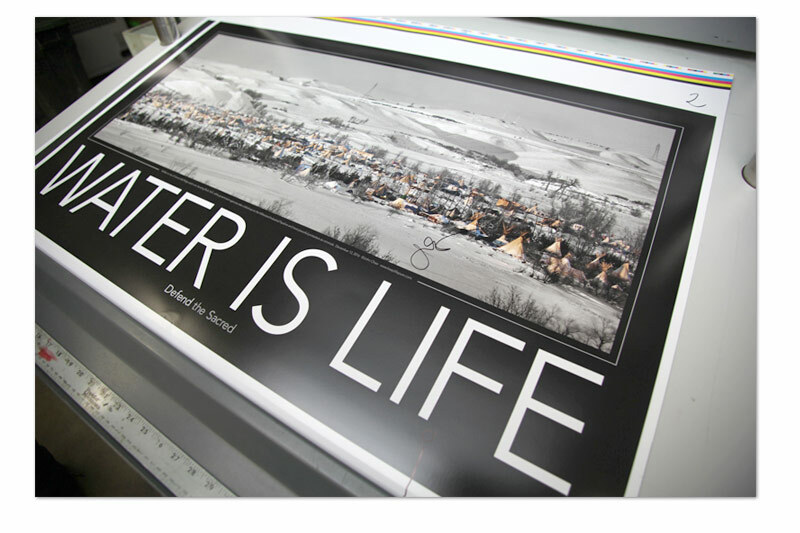 Here is the link to my photograph of our signatures at Standing Rock. Tells us your STANDING ROCK story. Share your photos and be a part of the Sacred Legacy.